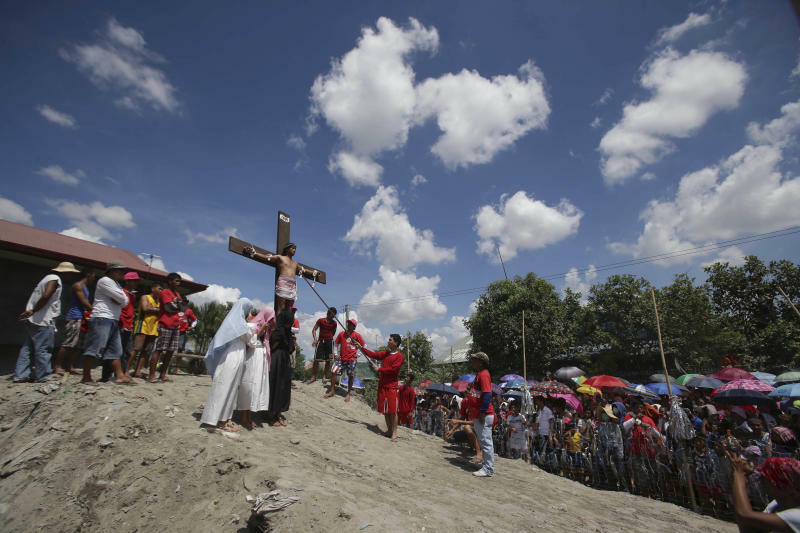 SAN PEDRO CUTUD, Philippines (AP) — Devotees in northern Philippine villages had themselves nailed to wooded crosses to re-enact the crucifixion of Jesus Christ as thousands of local and foreign spectators watched the bloody annual rites to mark Good Friday in Asia's largest Roman Catholic nation. Church leaders and health officials have spoken against the practice, which mixes Roman Catholic devotion with folk belief, but the annual rites continue to draw participants and huge crowds, particularly in northern Pampanga province. 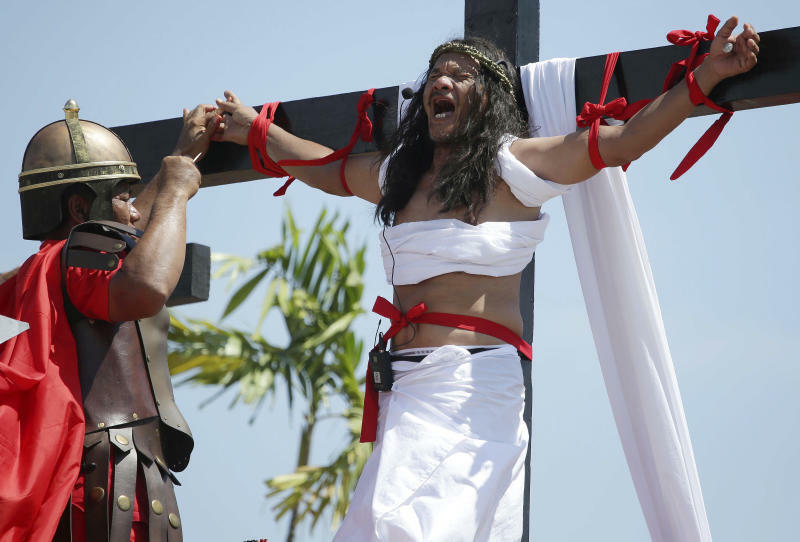 Sign painter Ruben Enaje, 53, had himself nailed to a cross at a dusty mound in Pampanga's San Pedro Cutud village for the 28th year. He began his yearly rite after surviving a fall from a building. Men dressed as Roman soldiers hammered stainless steel nails into his palms and feet, as a crowd of onlookers stood with cameras ready to capture his and other penitents' agony. Lasse Spang Olsen, a 48-year-old filmmaker from Denmark, also had himself nailed to a cross, joining Enaje and eight other Filipino devotees. He grimaced in pain as nails pierced his hands and feet. Olsen said he made a film two years ago about Enaje's yearly crucifixion and decided to have himself crucified after falling sick twice. He had a small camera attached to his cross while a colleague filmed his experience. "It's a personal matter between me and (God)," he said, with his finger pointing up. After being helped down from the cross, he said of his experience: "Fantastic, you should try it." Archbishop Socrates Villegas, head of the Catholic Bishops Conference of the Philippines, discouraged the crucifixions. "If what you do makes you love others more, then it is pleasing to God," he said. "But if you do it for photographs, just to be famous, that is spiritual vanity." The health department also discouraged the practice because of health risks. Health Undersecretary Eric Tayag urged devotees to get anti-tetanus shots. Devotees undergo the crucifixions in the belief that such extreme sacrifices are a way to atone for their sins, attain miracle cures for illnesses or give thanks to God.